This will show you how you can adjust the enroute map. 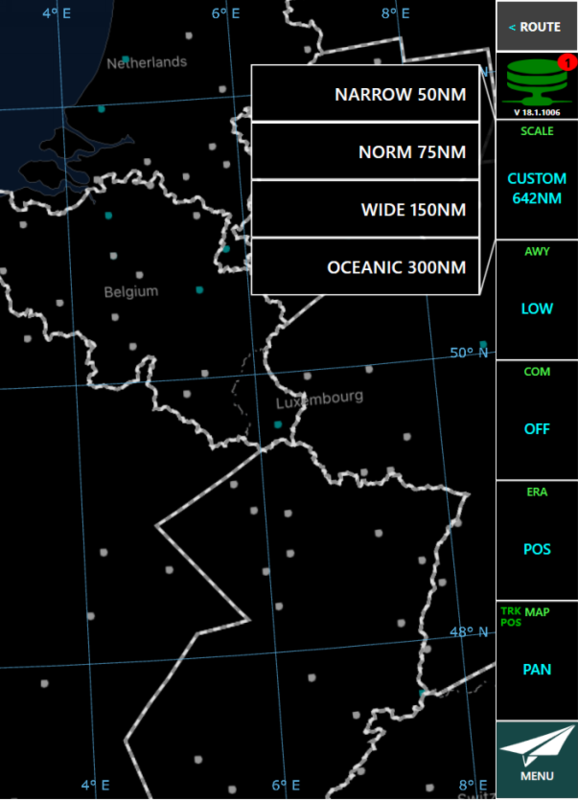 ■ Scale - controls the width of the map displayed in nautical miles (NM). ■ AWY (Airway) - controls whether to display high or low airways and related information on the enroute map. ■ COM (Communication) - controls the display of radio communication frequencies. 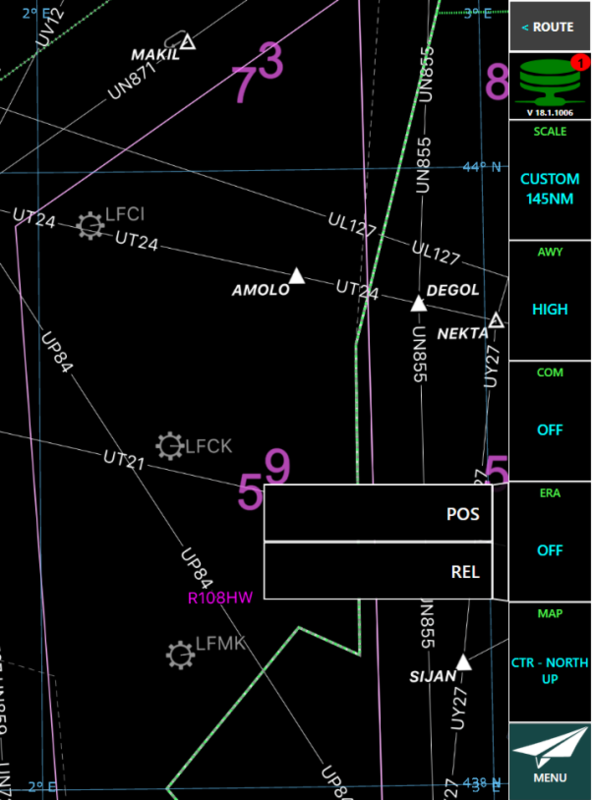 ■ ERA (Enroute Alternate) - controls the display of aerodromes in your terminal chart library that may serve as enroute alternatives. ■ Map - three possible options PAN, CTR North Up and CTR Track Up. Here is the ribbon tile located on the right hand side of the map. We shall now go through each of the tiles in more detail. Currently the ribbon tile is on the right hand side of the screen. If you are using a tablet and working in portrait then the ribbon tile will be at the bottom of the screen. 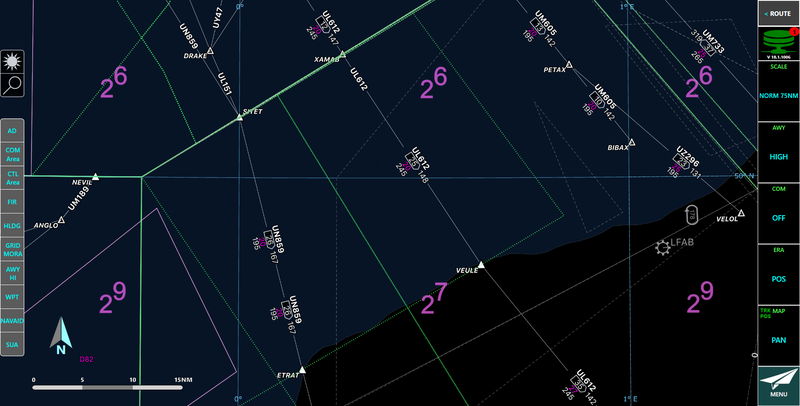 The scale controls the width of the map displayed in nautical miles (NM). The widths assigned to the OCEANIC, WIDE, NORM and NARROW options are by default set to 300NM (OCEANIC), 150NM (WIDE), 75NM (NORM) and 50NM (NARROW)., however, your system administrator may define custom zoom levels. If you pinch zoom or use your mouse wheel to zoom in or out it will change to CUSTOM with the relevant distance in NM showing, as it is currently showing custom 642NM. We will zoom into NORM 75NM. 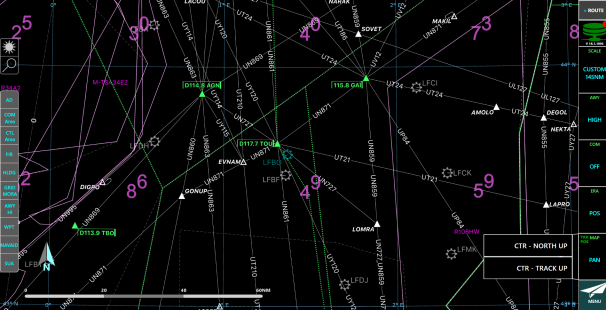 The map has now zoomed in to NORM 75NM as shown in the ribbon tile. 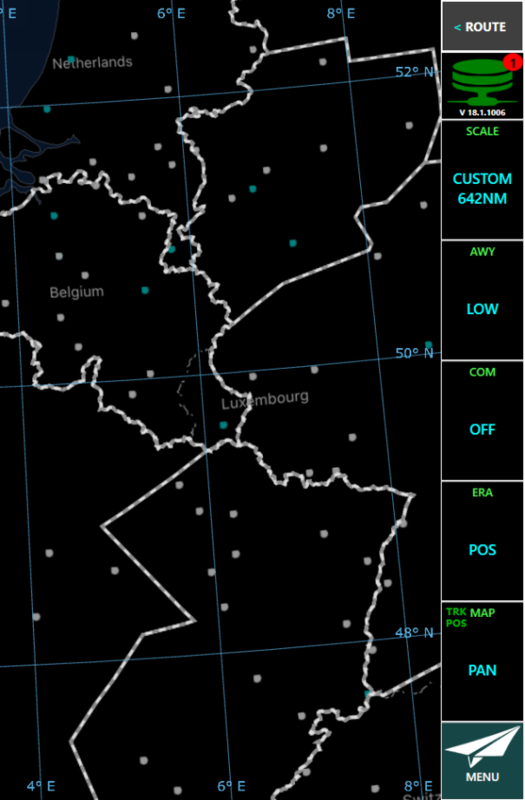 High airways are displayed in black in day mode and white in night mode while low airways are displayed in cyan in both day and night mode. Let's change the airway to high. Click the AWY menu item. You can now see that the airways have changed to white. When selecting AWY HIGH, only information that relates to the high level airways structure is displayed, including Waypoints, Navaids, Special Use Airspace, Holdings and Control Area information. High level airways will be presented in white in night mode and black in day mode. Low level will always be in cyan color. Let's have a look at the communications feature on the ribbon tile. Click the COM menu item. You can see that the communication features controls the display of radio communication frequencies box in the bottom right corner. Frequencies shown are those applicable to the center of the Enroute display, indicated by the cross hair symbol in the center of the screen. ERA (enroute alternate) Currently you can see that it is turned off. This will display aerodromes in your terminal chart library that may serve as an Enroute alternatives. With ERA in the OFF mode, notice how LFBO is in gray color. Let's turn it to POS mode and see what happens to our aerodrome. Click the ERA menu item. When ERA goes to POS mode this will indicate all the aerodromes that are part of your terminal chart library in the following dedicated color. 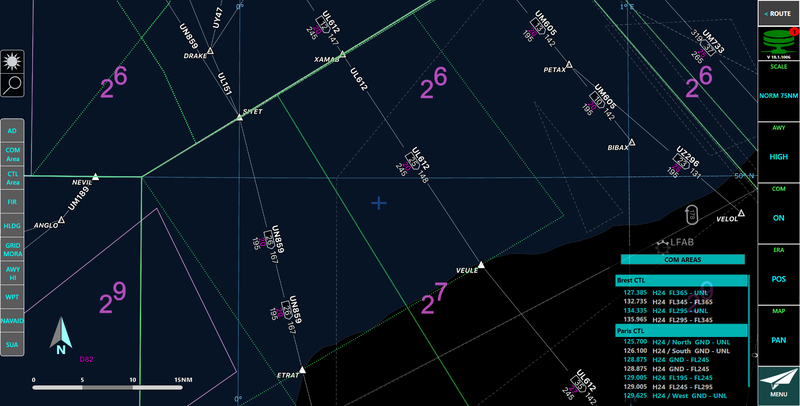 When in ERA is set to POS, tapping an aerodrome that is contained in your terminal chart library will ask you whether you want to add the aerodrome to your ALTN chart screen. The map is currently set to PAN mode, allowing you to move freely around the map. Let's have a look at changing this option. Let's first look at CTR North Up. Notice how the north arrow is blue. Click the CTR North Up list item. CTR North Up is available when your system is receiving location from location services or receiving both GPS location and track data. Location is displayed on the map using the internal or external GPS feed. Let's have a look at what happens when we change the ERA. Click the POS list item. Turning on POS when in CTR North Up mode will present you with your current position indicated by a dashed blue circle. Click the REL list item. Changing the ERA to REL will present you with arrows showing your up to four alternate aerodromes nearest to your current aircraft region that belong to your subscription. The REL option is available only when MAP is set to CTR - NORTH UP or CTR - TRACK UP these options are only available if Location Services are turned on, see Settings for more information). In some instances, ADs can be on the same path. When ADs are on the same path the arrow is widened. Note: the radiating arrows might be overlapped, but not for labels. Let's now have a look at CTR Track Up. Click the CTR - Track Up list item. CTR - Track Up is only available when you are receiving both location and track data. track of the aircraft using the location position feed. The current aircraft symbol will be shown – please verify the use of this mode against your operational approval. 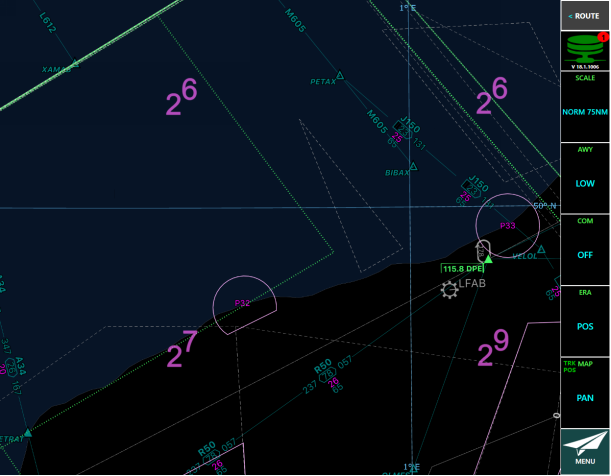 If you loose track data during the flight, Track Up is disabled and will revert to North Up mode. Let's have a look at the North symbols and their meanings and presentation in the different day and night modes. 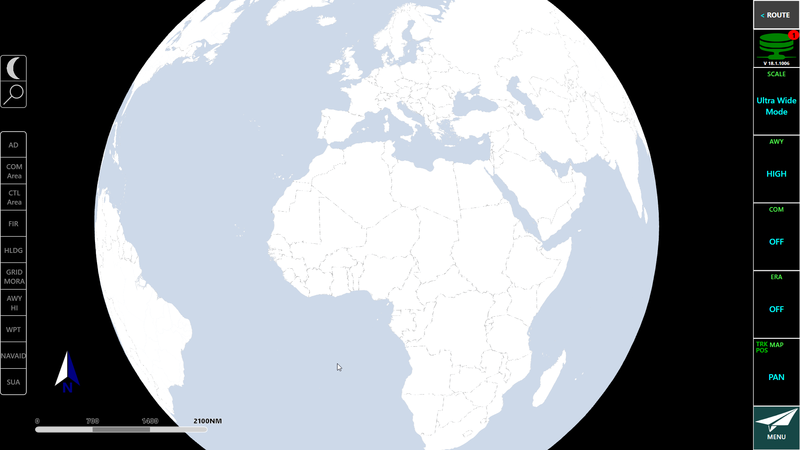 In pan modes the map is rotated, or non-true North Up orientated, the map symbol rotates to point at the map's True North. Tapping on the north symbol will automatically re-orientate the map to North Up. 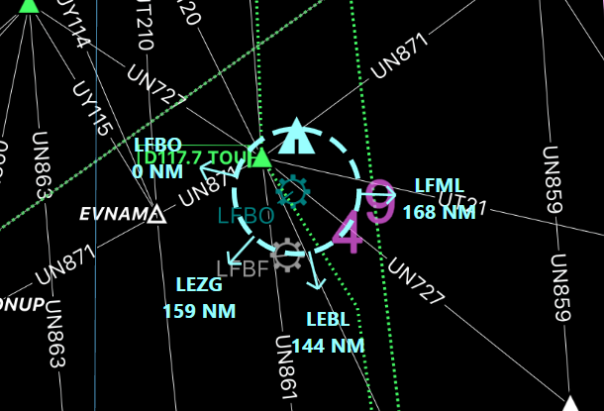 Please consider the applicable civil aviation authority regulation regarding the use of position feed to enable enroute map functionality. If in doubt please contact your airline's EFB administrator.